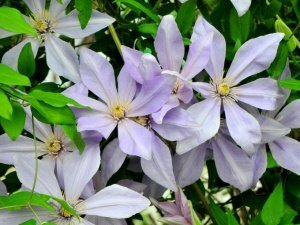 We’ve all seen the large-flowered clematis varieties on mailboxes or lampposts. Their lush blossoms seduce us with promises of summer-long color. But they can be daunting to the gardener inexperienced with the genus. How should they be planted? What about pruning? Dan Long, owner of Brushwood Nursery, in Athens, Georgia that specializes in clematis and other vining plants, recommends gardeners in the South begin with some lesser-known, but no less spectacular, clematis species Clematis viticella and C. texensis hybrids and cultivars. Clematis viticella cultivars are recommended for their attractive flowers and resistance to clematis wilt. ‘Madame Julia Correvon’ and ‘Etoile Violette’ are two well-known cultivars typical of this group. Both grow vigorously to roughly 10-15 feet, and their sepals twist slightly, adding a textural appeal. Gardeners who prefer to use native plants or who like for their neighbors to ask “Hey, what’s that gorgeous plant?” can look to the Viorna group, which includes C. viorna, C. texensis, and C. crispa, among others. Although not as famous as their flashy, large-flowered relatives, these vines have plenty of charm. Native to the southeast and south-central United States, some of these clematis are fragrant, many attract hummingbirds, and most bloom throughout the summer. 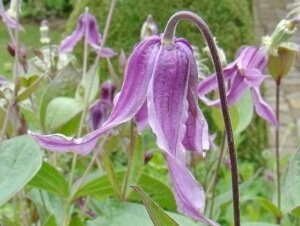 The flowers on Clematis crispa look like white top hats whose brims can’t stop curling upwards, and C. crispa ‘Big Sombrero’ looks like a tiny purple octopus. 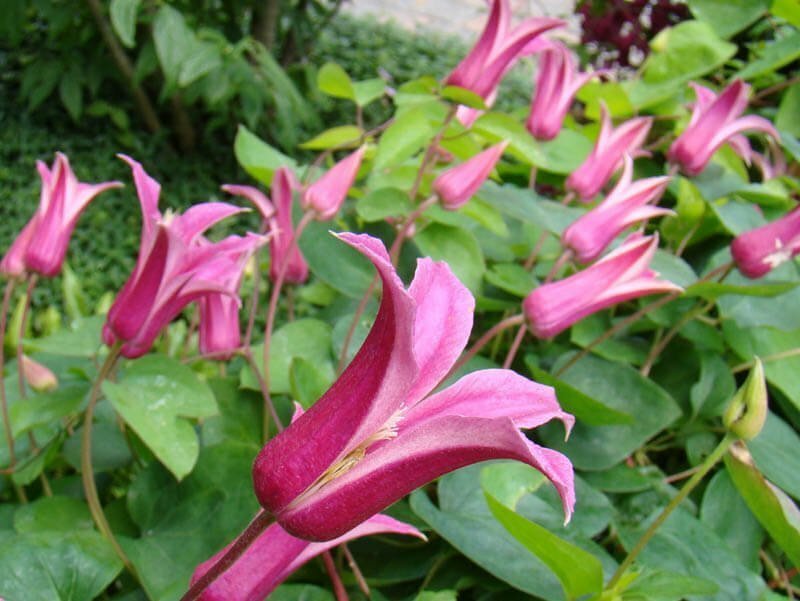 Clematis ‘Duchess of Albany’ and ‘Princess Diana’ are texensis hybrids whose medium-pink sepals look like tulips or trumpets. Two new hybrid clematis, ‘Sugar Sweet Lilac’ and ‘Sugar Sweet Blue’, offer the glorious flowers many gardeners seek but offer a special bonus: they’re fragrant. ‘Sugar Sweet Blue’ smells like honeysuckle, and ‘Sugar Sweet Lilac’ smells a bit spicy like chai tea. Both cultivars, whose parentage is kept secret by the breeder, bloom in April but do not repeat bloom. Clematis armandii is an evergreen, early-blooming species that doesn’t require pruning at all. If you like the star-shaped flowers of sweet autumn clematis (C. terniflora) but not its invasive habit, C. virginiana is a better-behaved substitute. 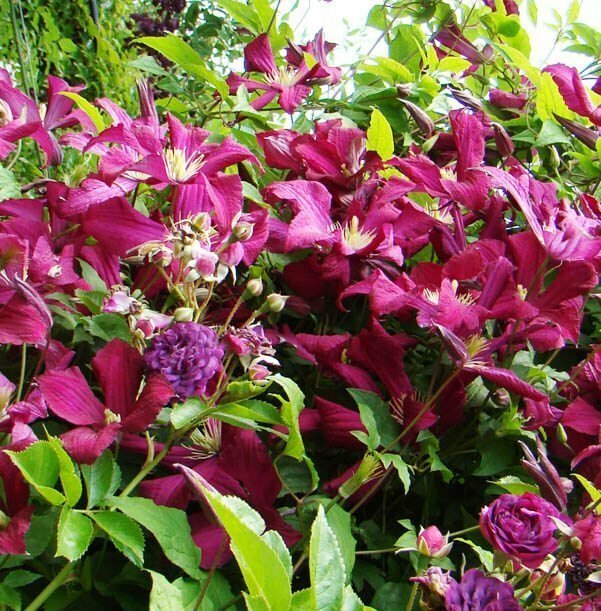 If you don’t have anywhere for a clematis to climb, grow an herbaceous, clumping type. C. integrifolia varieties like ‘Floris V’ will look right at home in beds and borders and bloom steadily even through sweltering summer months. 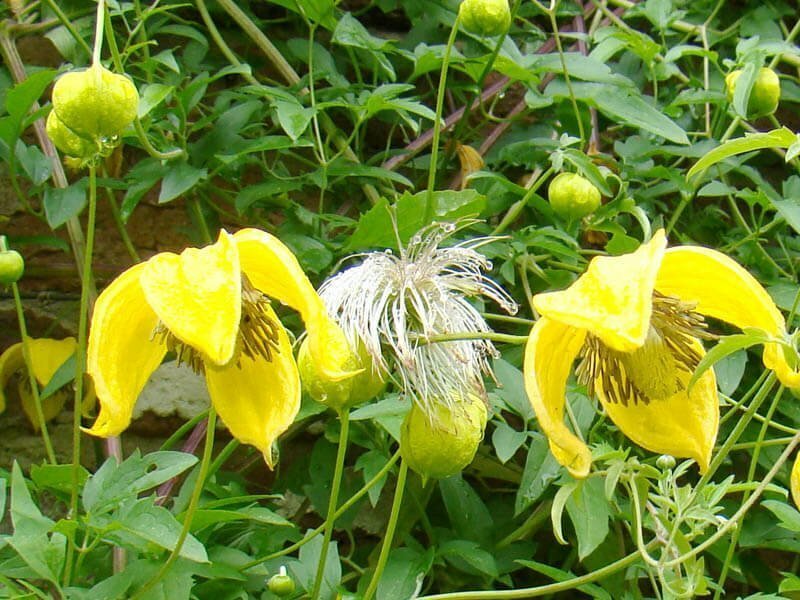 Clematis are long-lived plants, so site them carefully. 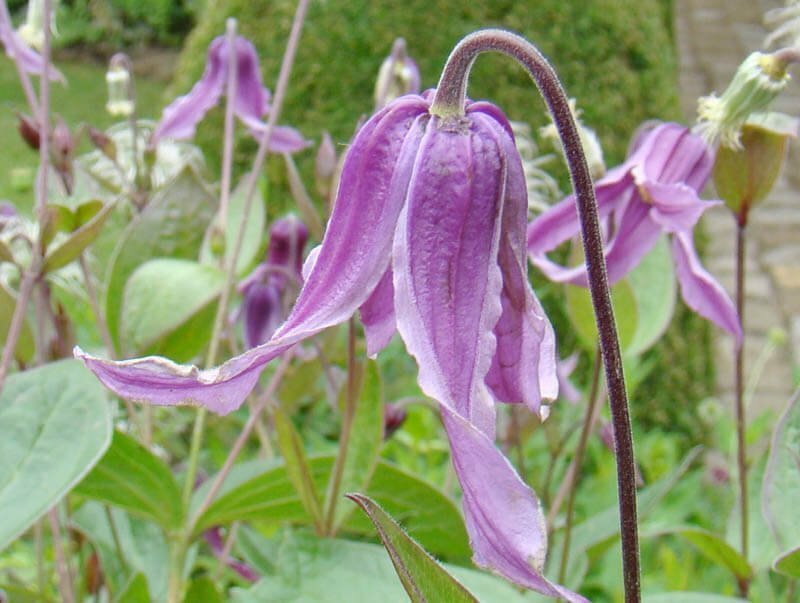 The advice that clematis like “heads in the sun, feet in the shade” is generally true, although it is more restrictive than clematis actually demand. Clematis roots want to be moist, but not waterlogged, and all clematis species like rich, fertile, well-drained soil. Dig a hole twice as large and twice as deep as the root ball. Mix the excavated native soil with compost, leaf mold, or manure, and backfill the hole partway as when planting a rose. Gently tease apart any circling roots, taking care not to damage them. Plant the clematis so that its crown is 2 to 3 inches below the soil line. Planting deeply encourages the production of numerous shoots, keeps the roots cool, and allows the plant to rebound from any late frosts or from the occasional disease. Covering the roots with flat stones can help keep the roots moist and cool, but a thick layer of organic mulch or companion planting with perennials that will shade the roots will accomplish the same goal. Group 1: These flower in spring on last year’s growth. These are the easiest to manage, because pruning is only done to remove dead wood or touch up their appearance. If you want to tidy them up, do so immediately after they flower. Group 2: Early summer bloomers flower on previous years’ growth, but they also flower in late summer and autumn on new growth. Prune these lightly in early spring, cutting just above healthy buds. Also remove weak stems and dead wood. Group 3: Prune late-flowering clematis hard in early spring, cutting back to about 12 to 24 inches tall. These are good clematis to train through a deciduous shrub, as you can prune them while the shrub is dormant.